Well another year has passed and we would like to take a moment to wish all of our wonderful patients a happy new year. 2009 was truly a year of highs and lows. Over the past twelve months we celebrated memorable milestones, received the highest professional awards and stared tragedy in the face as we almost lost one of our own. As 2009 began we proudly entered our 45th year of practice. To celebrate, our Colonia location held a “Patient Appreciation Day” to mark this inspiring milestone. The event was a huge success and will be a day to remember for years to come. 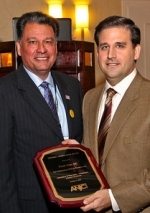 In the fall, the Association of New Jersey Chiropractors honored Dr. Frank Stiso Sr. with the prestigious Chiropractic Lifetime Achievement Award. To make the occasion even more memorable the award was presented by his son Dr. Frank R. Stiso. As the year comes to a close we are proud to announce that once again Dr Stiso was voted “one of the best” chiropractors in both Monmouth and Middlesex Counties by the readers of the Home News Tribune & the Asbury Park Press. We’d like to thank all of those who voted this year. And on November 10th the Stiso family held their breath as Dr. Frank was rushed to the hospital and underwent emergency surgery. His chances of survival were only 60/40. Thanks to the wonderful surgeons at Atlantic Shore Surgical in Point Pleasant NJ and all of your thoughts & prayers Dr. Frank R. Stiso on his way to making a full recovery. Want To Join Our Mailing List. ?